Mira, a cool red giant, is one of the most popular stars in the AAVSO observing program. The first official observation of Mira in the AAVSO database was made by Joao de Moraes Pereira in St. Michael, Azores, on 10/16/1902 (8.4 mag). 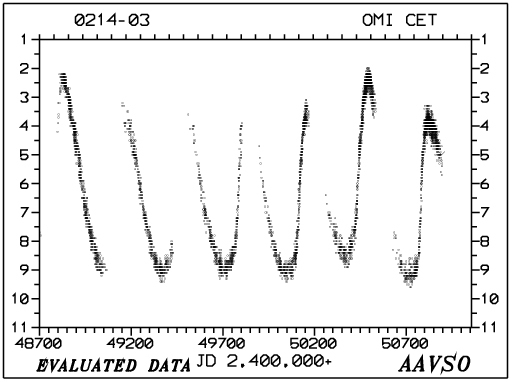 As of August 31, 1998 there have been more than 46,000 observations of Mira reported to the AAVSO by over 1,600 observers. David Fabricius of East Friesland, Germany is recognized to have discovered OMICRON CETI in 1596 while searching for Mercury. Later in 1638, Johann Holwarda, also of Friesland, determined its period to be 11 months and so established it as the first long period variable discovered. In 1642 Johannes Hevelius of Danzig named the star Mira, "The Wonderful". 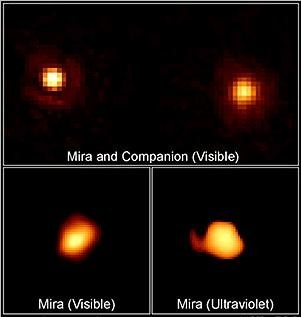 Recently the Hubble Space Telescope was used to distinguish Mira as a binary star system. "The spectra of Mira variables are beautiful to the eye." A whole class of variable stars have been named after Mira. "Mira-type" stars are variables with a period of around 100 - 1000 days and with visual light variations of more than 2.5 magnitudes. This year we celebrate the 400th anniversary of Fabricius' discovery of Mira, "The Wonderful," in 1596. But was he the first? Within the first century following Fabricius, four Mira-type variables were discovered, and in all cases it has been found that the stars were suspected of being novae long before their "official" discovery in the Western World. Three of the four had been recorded as novae in early Chinese or Korean records. By 1896, 251 Mira-type variables had been discovered, most of them after the beginning of photographic experimentation. Now in the year of the fourth centennial, over 6000 Miras are known. Because of their ease of discovery relative to stars of small amplitude, no new Mira stars reaching naked-eye visibility have been discovered since 1899. The history of the discovery of Mira-type variables illustrates that (1) some new discoveries are re-discoveries of objects previously assumed to be novae; and (2) apparently logical deductions that early observations of a guest star correspond to a later discovered Mira-type may nevertheless be wrong. Introducing Mira Variables, by Janet A. Mattei. Narrow-Band Photometry of Mira Variables, by Robert F. Wing. Personalities of Mira Variables as Revealed by Their Spectra - Verdict: Bizarre!, by Robert F. Garrison. High Angular Resolution Observations Of Miras, by Margarita Karovska. What Kinds of Dust Exist in Circumstellar Shells of Miras?, by Irene R. Little-Marenin & Stephen J. Little. Microlensing Surveys and Long Period Variables, by Marie-Odile Mennessier. Studies of Mira Stars and Their Small Amplitude Relatives, by John R. Percy. "Theoretical Glue": Understanding the Observed Properties of Miras with the Helo if Theoretical Models, by Lee Anne Willson. Visual Observations of Nine Neglected Southern Long Period Variables, by Thomas A. Cragg. Printed copies of this journal are still available. They can be ordered through the AAVSO Online Store.